Gusteau: If you focus on what you’ve left behind, you will never be able to see what lies ahead. Rats are a hard sell. They’re filthy little rodents with fierce, ugly teeth that scurry across your feet when you aren’t expecting anything, dragging their long, scaly tails behind them and sending those they cross into squeals of fear. Rats in a kitchen comedy are arguably an impossible sell. If you don’t like rats to begin with, you certainly don’t want them anywhere near your food. Yet here we are smack in the middle of the premise for the near infallible Pixar’s latest summer crowd pleaser, RATATOUILLE. 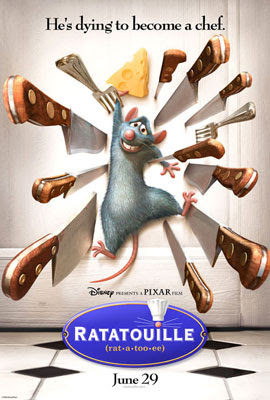 Separated from his rat colony, Remy (voiced by comedian Patton Oswalt), finds himself accidentally putting his culinary talents to good use in what was once one of Paris’ most prestigious kitchens, earning him rave reviews. Of course a rat can’t take credit for fine food preparation so he forms an unlikely friendship with a gangly, awkward fellow by the name of Linguini (Lou Romano), who serves as his front. Together they bring new life to an aging restaurant and inspire each other to be better than they believe themselves to be. The folks at Pixar might have been sniffing too many expensive cheeses when they concocted this mousecapade but they may also be the only people out there who could have pulled it off. Only, under the writing and direction of Brad Bird (THE INCREDIBLES), they didn’t just pull it off; RATATOUILLE is a masterwork in the field of animated filmmaking, deliciously reaching heights that no rat has ever reached before. Remy is no ordinary rat. He has a gift, a gift that is being squandered at home. He knows the spice for every occasion yet his overbearing father (Brian Dennehy) uses his heightened senses as a tool to sniff out rat poison amongst the garbage. Like so many of us born into situations that do not lead instantly to fame and fortune, Remy is destined for greatness but has yet to be discovered. Not only does he need to win over the hearts and stomachs of notoriously finicky food critics (like the one voiced so delectably by Peter O’Toole) but he must also win over the potentially lost appetites of modest movie goers who may not want rats with their popcorn. Bird’s animators studied the bahavior of rats extensively and felt it would be best to have the rats walk about like humans, on two feet, in an effort to appear more likeable. Bird refused. He wanted the rats to act like rats. He wanted their ideals to win us over. When trapped in a jar early on in the film, it is Remy’s charm that gets him set free. There is an earnestness, a yearning, a hope seen deep in his pleading eyes that reminds us just how often we find ourselves trapped in jars by people bent on keeping us down. Besides, aren’t we all just rats in the race? Like Remy, Bird and his Pixar cohorts know to add a sprinkling of depth to their dishes and that presentation is key. RATATOUILLE raises the Pixar standard of beauty to new levels while seasoning the whole with hints of meaning that are only completely realized once they hit your palette. Pixar’s Paris is a foggy riverside with scattered street lamps at one moment and a string of window lights and fountains the next. While it is romantically distracting, it is nowhere near as chaotic as the view from two inches above the floor. Rats scamper and the camera follows as Remy swerves in and out of kitchen crevasses and sewers (always sure to wash his hands before touching the food). The fluidity of the movement through such luscious colour is hypnotic and magical, simply what one would expect from the city of love. Somewhere tucked away in this city is a tiny one-bedroom apartment the size of a storage space known as not much but still home to Linguini. The friendship formed between the man and his rat is unlikely, yes, but it anchors the film with its humbling mutual appreciation. They learn to rely on each other without forgetting how to contribute the most vital parts of themselves. Theirs is a friendship so powerful and so respectful that it changes the minds and hearts of the naysayers who play witness to it, including those sitting comfortably in front of the screen. 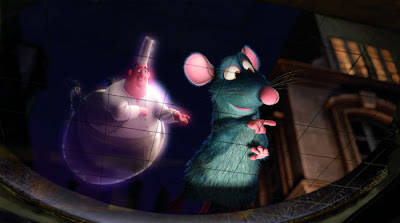 “Anyone can cook.” These are the words of Chef Gousteau, Remy’s inspiration and hero, that run throughout RATATOUILLE. Cooking can be interpreted as anything and therefore anyone can do anything they want. Just look at Remy, a rat with an impossible dream that comes true despite every odd and thanks to hard work (and a dash of fate). Better yet, just look at Pixar. By not simply following the recipe but rather using inspired, unusual ingredients, they have managed to make a mesmerizing masterpiece that is astonishing, endearing and about a rat. How many sheep would you give Ratatouille? Gotta love that rat !